Experts say that each year many homeless and foster youth access higher education without the support they need to stay in school and graduate. When Ashley Haynes-Gibson first filled out a college application, she wasn’t sure if she should list her birth parents or her foster parents on the form. Her foster parents paid her application fees, but when it came time to co-sign on a student loan, Haynes-Gibson was on her own. “It was just painful because I had thought they trusted me more than that and could see I am responsible,” said Haynes-Gibson, 22, who works two jobs to help support herself in college—one transporting foster children to supervised visits, and another running food in a restaurant. Still, she is grateful for the financial support her foster parents did provide with her college application. She said her first foster parents probably wouldn’t have done so. And many other young people who grew up in foster care don’t get any help at all. Haynes-Gibson’s story represents just one from an estimated 415,000 children in foster care, according to the federal government, who could face similar situations when it comes time for them to apply for college or fill out the Free Application for Federal Student Aid (FAFSA). Some 1.3 million homeless children and youth are currently enrolled in U.S. public schools, according to the National Center for Homeless Education, and could also face difficulties in the college application process. But a new bill introduced in November could help make those processes easier if it becomes part of the reauthorization of the Higher Education Act (HEA), say advocates for homeless and foster youth. The bill is known as the Higher Education Access and Success for Homeless and Foster Youth Act of 2015. It was introduced by U.S. Senator Patty Murray (D-Wash.), ranking member of the Senate Health, Education, Labor, and Pensions (HELP) Committee. Advocates say the proposed legislation would alleviate a series of burdens that homeless and foster youth experience when they perform perfunctory tasks—in Haynes-Gibson’s case, filling out forms to go to college and get financial aid—that are already considered difficult, even for young people who haven’t experienced homelessness or foster care. Cyekeia Lee, director of Higher Education Initiatives for the National Association for the Education of Homeless Children and Youth (NAEHCY), said each year many homeless and foster youth access higher education without the support they need to stay in school and graduate. Lee said many campuses have not put a plan in place to identify or support homeless or foster youth—as evidenced in the nearly 2,500 calls and emails NAEHCY has received on a higher education helpline that she has staffed herself—from 8:30 a.m. to 5 p.m.—since 2012. 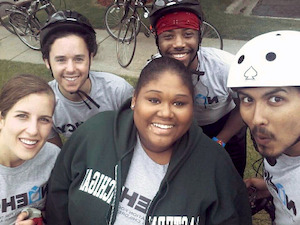 “These calls include requests for advocacy, intervention and resources for homeless and foster youth across the nation [who] continue to experience barriers on college campuses,” said Lee, who draws from her prior experience as a university financial aid worker and as a life skills coordinator at a youth shelter, where one of her duties was to staff a crisis hotline. That is, if homeless students call at all. According to materials furnished by Sen. Murray’s staff, the proposed legislation would clarify that youth under age 24 who are determined to be unaccompanied or homeless are considered independent students and can get the full financial aid they need. The bill also seeks to explain that foster care support and services that help foster youth survive do not count as “income” for purposes of calculating financial aid. And it would provide homeless and foster youth in-state tuition rates to reduce barriers to college attendance due to lack of financial support. This is not the first time such legislation has been introduced, but advocates believe this bill has a good chance of passing once Congress moves to reauthorize the Higher Education Act. “The real question is if we will see the same bipartisan commitment to passing HEA that we are now witnessing with the Elementary and Secondary Education Act (ESEA),” said Barbara Duffield, director of Policy and Programs at NAEHCY. Duffield said the December passage of ESEA, which was quickly signed into law by President Barack Obama, includes important provisions for homeless and foster youth at the K-12 level that that could make it easier for them to access college and financial aid to pay for it. One such provision is that local liaisons must ensure unaccompanied, homeless youth are informed of their status as independent students for the purpose of college financial aid. The passage of ESEA could clear the way for the higher education bill to “proceed to the finish line next year in the same bipartisan fashion,” Duffield said. Murray’s bill also calls for a “single point of contact” on campus to assist homeless and foster youth to access and complete higher education. Lee said single points of contact—referred to as SPOCs—make it easier for homeless or foster youth to move through the paperwork. NAEHCY currently has a network of more than 400 SPOCs, each at a different location—mostly campus staff that volunteer to serve the role. Tori Weigant, assistant director of financial aid at West Chester University of Pennsylvania, serves as a SPOC at the university, where she said 26 of the 17,000 students have been determined to be homeless. She said SPOCs play a vital role for students who may not know that they qualify as independent students for the purpose of financial aid. “If the school doesn’t have a SPOC, the student is more likely to fall through the cracks,” Weignat said. Often, she said, homeless youth may have incomplete or incorrect information on their financial aid applications, which can cause their applications to get rejected or reduce the amount of financial aid they receive. “If you’re asked for parental information and you list someone else, it’s counting that person’s income as a means of supporting you, even though they may be only providing a couch,” Weignat explained. Part of Weignat’s job is to train campus employees to refer students to her whenever a student reveals something that may indicate homelessness. “I have had campus administrators tell me they didn’t know that was a status,” Weignat said. Haynes-Gibson said a SPOC would benefit students who’ve been in foster care. Lee said having a SPOC does not absolve a college or university of trying to institutionalize the things that SPOCs do. “Although one person may be identified as a SPOC, there is an institutional approach to creating a campus culture to better support homeless and foster youth on campuses,” Lee said. “Many SPOCs conduct trainings for every department on their campus including faculty, staff and even students,” said Lee, who has conducted about 30 trainings for colleges and universities since 2012 on how to create a campus culture that is supportive of homeless and foster youth. Lee cited the need for more college recruitment of homeless and foster youth—something called for in Murray’s legislation but which Lee said currently only exists on a smaller scale. Haynes-Gibson has received limited help through the University of Seattle’s Fostering Scholars program, which provides financial, academic and personal support for former foster youth toward the completion of an undergraduate degree. She said she “absolutely” thinks more outreach would be beneficial to homeless and foster youth. This story also appears in Youth Today, the national news source for youth-service professionals, including child welfare and juvenile justice, youth development and out-of-school-time programming.